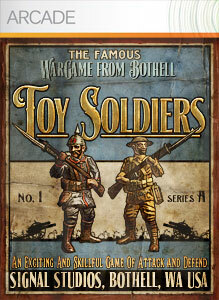 "Command your TOY SOLDIERS in epic, action-packed battles. Position your defenses and take direct control of your artillery to bomb the enemy positions, pilot your bi-plane against the enemy trench, or maneuver your tanks across No-Man’s Land… and lead your TOY SOLDIERS to victory! Dive into 2-player head-to-head combat, local and on Xbox LIVE."